The Superior rooms have a view to the courtyard. Superior Room Facilities: FREE High Speed Internet, Air-conditioning, King Size bed, IPTV, Located in the quiet rear of the hotel, Marble bathroom with bath or shower, Antique furniture. Please specify in Special request box if you require Double or Twin Room. FREE cancellation at least 2 days before your arrival. The price includes breakfast and VAT. Stay Longer For Less offer: Free cancellation at least 2 days before your arrival. 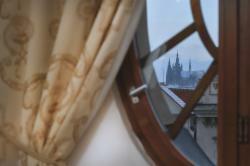 The SQUARE VIEW Rooms have a view of the Old Town Square with Astronomical clock . Square View Room Facilities: Amazing view of Old Town Square, Old Town Hall and Tyn Church, FREE high Speed internet, Air-conditioning, King Size bed, IPTV, Marble bathroom with bath or shower, Antique furniture. 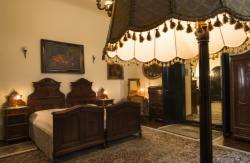 The Historical Superior rooms have 25-31m2 and original mural ceilings. 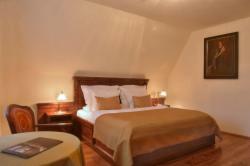 Historical Superior Room are located in our adjacent building (no elevator). Historical Superior Room Facilities: View to a romantic Old Town street, FREE High Speed Internet, Air-conditioning, King Size bed, IPTV, Located in the quiet rear of the hotel, Marble bathroom with bath or shower, Antique furniture. Free entrance to the hotel's sauna. 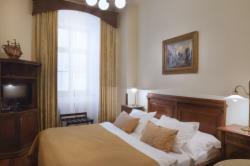 The luxurious, wide room, "Grand Deluxe" room has a magnificent view to the famous Astronomical Clock on the Old Town Square. Deluxe Room Grand Facilities: FREE high Speed internet, Air-conditioning, King Size bed, IPTV, Marble bathroom with bath or shower, Antique furniture. 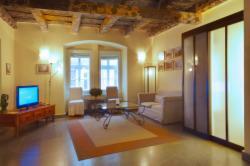 The Attic Suite is a unique 2 floor apartment with a view to the Old Town Square. Attic Suite, en-suite, located on the 3rd floor of our adjacent building(no elevator). Attic Suite Facilities: Two floors apartment, FREE high Speed internet, Air-conditioning, IPTV, Bedroom with King Size Bed on each floor, Bathroom with shower on the top floor, Bathroom with Jacuzzi on the lower floor, Antique furniture, Suitable for families with children, Extra bed and baby cot available. The Attic Suite can accommodate up to 5 people. This price is based on 2 people in the room, any additional adult will be charged Euro 50 per person per night. The price includes breakfast, VAT and Free entry to the steam sauna. 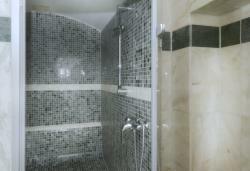 Luxury Apartment for 2 people (possibility of 1 extra bed available) - Best Available Rates. This apartment is not located in the hotel building! Check in will take place at the Grand hotel Praha reception and the doorman will take you to the apartments, which is 250 meters away. Unique offer of a luxury apartment after complete renovation. 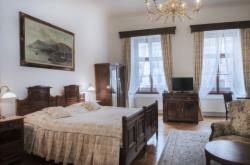 Special opportunity to stay in the heart of medieval Prague, in the neighborhood of the exquisitely preserved Old Town Square, the Charles Bridge and The Jewish Quarter. The theaters, restaurants and shopping malls are at close proximity. Numerous trams and metro to all parts of Prague. The apartment is located on the ground floor, it is fully furnished and features: Living room, bedroom, F/F kitchen corner, luxury marble-tiled bathroom. Original wood painted ceilings. 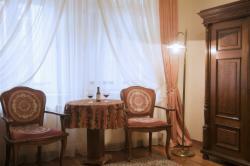 Cosy and inviting apartment, with all the modern facilities, TV, SAT, Internet etc. Breakfast and city tax (0,60 EUR per person/night) is not included. 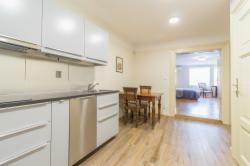 AN APARTMENT WITH KITCHEN PROVIDES BEST COMBINATION OF PRIVACY IN THE CITY CENTRE. AN IDEAL OPTION FOR FAMILIES. Our staff will gladly help you with luggage. Facilities: Bedroom with King size bed & double size bed, fully equipped kitchen, air-conditioning, IPTV, bathroom with shower. Suitable for families with children. City tax (0,60 EUR per person/night) will be charged. Our Presidential Suite has a separate living room and it has a view to the Old Town Square. Presidential Suite Facilities: Air-conditioning, FREE high Speed internet, Bedroom with King Size Bed, and separate living room, Cloak-room, Antique furniture, Private sauna, IPTV, Marble bathroom with bath and shower, Extra bed and baby cot available.